Sunderland midfielder Boudewijn Zenden says he is keen to establish a regular first-team role at the club. 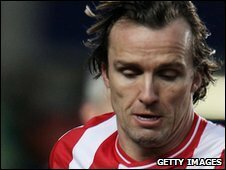 Zenden, 33, has made just one start in his 17 league appearances since arriving in October and his contract expires at the end of the season. "For me, the most important thing is to play," Zenden told BBC Newcastle. "I'm enjoying it very much, but it's hard for me to come on for just a few minutes. It's something I maybe have to talk to [manager Steve Bruce] about." Sunderland have the option of a further year's deal for the former Netherlands international. But while the former Liverpool and Barcelona winger is keen to play his part in the club's current Premier League campaign, he is keeping an open mind for next season. "It is still me being ambitious, trying to get the club forward and I'm still ambitious myself to do better every game," Zenden added. "With that, I'm still looking to get my games, and trying to improve myself and other players around me. "I signed a deal until the end of the season, and the only thing that hasn't happened yet is to have a chat with the gaffer." Zenden, who has also played for Chelsea and Middlesbrough during spells in England, has made more than 300 league appearances since his debut for PSV Eindhoven in the 1994/95 season.